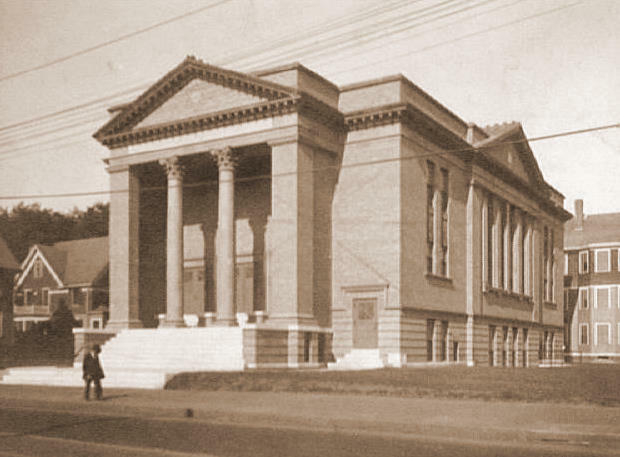 Temple Beth El in the 1930s (Providence Public Library Rhode Island Collection). Since I first visited the Broad Street Synagogue two years ago, I have been struck by the sheer weight of the stories it represents. As a longtime neighbor of the synagogue has told me, even if you have only the most glancing connection to it or have never been inside, it is still there. Through its physical presence, it bears witness to more than one hundred years of events, the small accumulated stories that become history, on the corner of Broad and Glenham. And of course, like any place, the people who shape it and whom it shapes connect it with other places and other stories in the neighborhoods of Broad Street and beyond. a timeline outlining events in the synagogue’s history, from its opening in 1911 to the recent revitalization efforts. As with virtually any historical project, converting stories into this archive involves synthesis, narrowing down a vast amount of material into a smaller collection for publication. I will be taking excerpts from conversations that I think best reveal different aspects of the synagogue’s history (and of course, that interviewees have given me permission to use): memories that illuminate larger themes such as transition, division, immigration, change, continuity, and tradition. Yet for this project to reflect adequately the different experiences of the many people connected with this building for more than a century, it has to follow the spirit of the Broad Street Synagogue revitalization project as a whole. It needs to be centered on community collaboration and contribution. It should be not one story, but many stories, and as diverse, wide-ranging, thought-provoking, and accessible as possible. For this reason, I encourage you to contact me at broadstreetsynagogue@gmail.com. Your comments, questions, and recollections about life in the vicinity of 688 Broad Street past and present will help to grow this collection of stories and images. And most importantly, it will bring in more voices about the past, present, and future of this neighborhood landmark — which is what this project is all about. Nate Weisenberg is a master’s candidate in public humanities at Brown University. He will be posting regularly to the blog throughout the spring of 2014. You can contact him at broadstreetsynagogue@gmail.com.